As Willie Mays celebrates his 80th birthday, the staff here at DeansCards.com decided to take a look at some of his best baseball cards over his 22-year-career for the Giants and the Mets. With the Giants, Mays won Rookie of the Year in 1951 and the NL MVP twice (1954 and 1965). Mays finished in the top 20 of the MVP voting 15, was named to the All-Star team 18 times, was given the Gold Glove Award 12 times, and was elected to the Hall of Fame in 1979. The logical place to start is with Mays' rookie card. Released in 1951 along with Mickey Mantle's rookie card, the 1951 Bowman is a horizontal card, which is somewhat unusual for the 1951 Bowman cards. It shows Mays about to swing, standing in front of some sort of cloth, perhaps for batting practice. Mays would be part of the first all African-American outfield in history. In 1952, Mays would be drafted by the U.S. Army and miss most of the 1952 and 1953 baseball season. 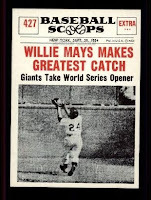 During the 1954 World Series, Mays made one of the most memorable catches of the decade and perhaps the entire century. Because there were no World Series recap cards like their would be in many 1960's sets, this catch would not be commemorate for several more years. One card that gives a great view of the over-the-shoulder catch is the #427 1961 Nu-Card Scoops. The Nu-Card Scoops set was intended to give a visual overview of some of the greatest plays in the past few decades of Major League Baseball. Although Mays wold have cards all the way through the 1973 Topps set, one of our favorites is the simple #5 1958 Topps card. The 1958 Topps set is the first to feature cards from the San Francisco Giants team. The New York Giants franchise moved to San Francisco during the summer of 1957, leaving New York City with only one baseball team until the Mets arrived 1962. 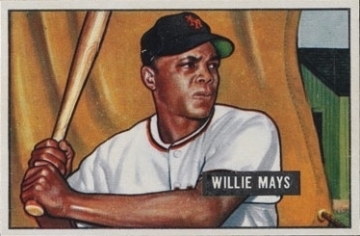 The 1958 Mays card is one of the few head-shots of the center fielder. Mays still looks the young, vibrant athlete that so many remember. 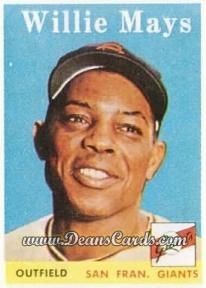 Please click here to see our full selection of Willie Mays baseball cards.